For other people with the same name, see Robert Lindsay (disambiguation). Robert Lindsay (born 13 December 1949), is an English actor. He is known for his stage and television work, including appearances with the Royal Shakespeare Company and in musical theatre, and his roles as the narrator on the TV adaptations of the children's television series Brambly Hedge, Wolfie Smith in Citizen Smith, Captain Pellew in Hornblower, and Ben Harper in My Family. He has won a BAFTA, a Tony Award, and three Olivier Awards for his work. Lindsay was born in Ilkeston, Derbyshire, to Joyce (née Dunmore) and Norman Stevenson, who worked at the local Stanton Ironworks. He was one of three children and his father was a World War II veteran, having been on a minesweeper, one of the first ships to land on D-Day. After leaving Gladstone Boys' School, Lindsay enrolled in the drama department of Clarendon College in Nottingham, intending to become a drama teacher. However, friends at Nottingham Playhouse encouraged him to apply to the Royal Academy of Dramatic Art (RADA), and in 1968, he was accepted there with the aid of a government grant. After graduation, he worked as a dialect coach for a repertory company in Essex, and then joined a regional theatre group. Lindsay's early career included roles in British films such as That'll Be The Day (1973), Three for All (1975), and Adventures of a Taxi Driver (1976). He came to prominence as the cockney layabout Jakey Smith in the ITV comedy series Get Some In! (1975–1977) and was given the starring role as delusional revolutionary Wolfie Smith in the BBC sitcom Citizen Smith (1977–1980), which raised his profile. Towards the end of the run of Citizen Smith, Lindsay won roles in the BBC Television Shakespeare series, including Lysander in A Midsummer Night's Dream (1981), Fabian in Twelfth Night (1980) and Benedick in Much Ado About Nothing (1984). He played Edmund in the Granada Television production of King Lear (1983). He played the role of Bill Snibson in the hugely acclaimed 1984 London revival of Me and My Girl (for which he won an Olivier Award) which subsequently transferred to Broadway, earning him a Tony Award against competition from performers in Les Misérables on both occasions. Lindsay's success on Broadway and in the West End led to a starring role in the film Bert Rigby, You're a Fool (1989), although it was not a commercial success. His next role was in the James Scott-directed Strike It Rich (1990) alongside Molly Ringwald and John Gielgud. He continued, however, to enjoy success on television, and played the leading role in Alan Bleasdale's dark comedy serial G.B.H. (1991), for his performance in which he won a BAFTA. Lindsay was also in Bleasdale's Jake's Progress (1995) the tale of a couple played by Lindsay and Julie Walters who were struggling to cope with a 'difficult' child (Barclay Wright). Both Bleasdale serials were screened by Channel 4, as was the surreal Channel 4 sitcom Nightingales (1990–93), which also featured David Threlfall and James Ellis. In 1996, Lindsay played the title role of Becket, the play by Jean Anouilh, opposite Derek Jacobi as King Henry II for which he won another Olivier Award. Lindsay won his third Olivier award after he took over the role of Fagin during 1997 in Cameron Mackintosh's London revival of Oliver! at the London Palladium. Lindsay appeared in the films Fierce Creatures (1997) and Divorcing Jack (1998) and in 1998, he was cast in the recurring role of Captain Pellew in the ITV mini-series Hornblower, based on the novels of C.S. Forester which ran until 2003. Lindsay was also the original choice for the lead role in the drama Cracker; however, he turned the part down as he did not want to become too associated with heavy, darker drama characters. He later appeared as Fagin in the 1999 ITV Oliver Twist miniseries. Lindsay's longest-running role has been Ben Harper in the popular BBC sitcom My Family (2000–11), opposite Zoë Wanamaker who played his on-screen wife, Susan. In October 2005, he starred in ITV drama series Jericho about a Scotland Yard detective investigating murder and kidnapping in London's Soho in the 1950s. In January and February 2006, he was the only actor (as Sneath) to appear in two loosely linked Stephen Poliakoff dramas, Friends and Crocodiles and Gideon's Daughter, shown on BBC One. Lindsay has also portrayed Prime Minister Tony Blair in the Channel 4 satires A Very Social Secretary and The Trial of Tony Blair. In 2003, he appeared in an episode of Absolutely Fabulous playing the character of Pete, an old musician boyfriend of Edina Monsoon(Jennifer Saunders), and also narrated the BBC documentary series Seven Wonders of the Industrial World (2003). He appeared in the 8th Ricky Gervais Video Podcast, in which Gervais announced that Lindsay would be in the second series of Extras, appearing in the last episode of the 2006 series as an arrogant, mean-spirited version of himself. Lindsay also appeared in the romantic comedy Wimbledon, as the tennis club manager who hires Peter Colt. In 2007 at the Old Vic Theatre, Lindsay played Archie Rice in John Osborne's The Entertainer, a role first performed by Olivier in 1957. In 2009, he played the protagonist, Maddox, from the Radio 4 comedy Electric Ink by Alistair Beaton. In 2010, Lindsay starred in the title role of Derby Live's production of Onassis before its transfer to London's West End. Lindsay stars as The Examiner in the British sitcom Spy which debuted in October 2011 on Sky 1 and returned to the cast in 2012 for a second series. In November 2011, he starred as Henry in a revival of The Lion in Winter by James Goldman at the Theatre Royal, Haymarket, London, a production which also featured Joanna Lumley as Eleanor, and was directed by Trevor Nunn. In 2012, Lindsay appeared in the Sky detective series Falcón, episode "The Silent and the Damned", as Pablo Ortega. In 2014, Lindsay starred as Lawrence in the UK première production of Dirty Rotten Scoundrels at Savoy Theatre London, directed and choreographed by Jerry Mitchell. On 9 May 2015, Lindsay recited the wartime speeches of Winston Churchill at VE Day 70: A Party to Remember. Lindsay sings the recorded version of Derby County F.C. 's song "Steve Bloomer's Watchin'", played and sung by the fans at the beginning of every home game. In 2016, Lindsay appeared in the second season of the ABC fairy tale-themed musical comedy series Galavant as Chester Wormwood, an evil wizard/wedding planner. He recurs in this role through multiple episodes of the season. In 2017, Lindsey played Hermann Einstein in the National Geographic US TV series Genius. In 2018, Lindsey was announced to be joining the cast of Disney's Maleficent: Mistress of Evil as King John. The film also features Angelina Jolie, Elle Fanning, Michelle Pfeiffer, and Chiwetel Ejiofor. The film is scheduled to be released on October 18, 2019. In 1974, Lindsay married Cheryl Hall, who later appeared opposite him in Citizen Smith. They divorced in 1980, when he started a long-term relationship with actress Diana Weston, with whom he has a daughter, Sydney Laura Stevenson, and who co-starred with him in three episodes of My Family. On 13 September 2006, Lindsay researched his family tree in the third series of Who Do You Think You Are?. He travelled to his hometown and to Turkey, where his grandfather Raymond Dunmore had taken part in the Gallipoli campaign during World War I.
Lindsay is a lifelong supporter of Derby County F.C., a fact which he stated in a short section for CBBC's Newsround entitled "My Team". Lindsay is known for his left wing political beliefs, usually describing himself as a staunch socialist, and has marched in support of miners. He was a passionate supporter of the Labour Party, but an outspoken critic of Prime Minister Tony Blair's decisions to go to war in Afghanistan and Iraq; stating to be "furious" and feeling disillusioned with mainstream politics: "You see those images of Iraq and Afghanistan and Lebanon, don't you? And I suspect somewhere, when he goes home at night and the kids are in bed, he must go, 'Jesus, what have I done?'" On 1 October 2016, he was given the Freedom of the Borough of Erewash. ^ "Profile: Robert Lindsay". BBC. ^ "Robert Lindsay Biography". BBC Derby. 17 January 2003. Retrieved 7 June 2008. ^ "RobertLindsay.net – Official: Film". www.robertlindsay.net. Retrieved 2 December 2015. ^ "The Trial of Tony Blair". Channel 4. 2008. Retrieved 7 June 2008. ^ D'Alessandro, Anthony; D'Alessandro, Anthony (29 May 2018). "Robert Lindsay & Chiwetel Ejiofor Joining 'Maleficent II' As Cameras Roll". Deadline. Retrieved 6 March 2019. ^ "My Team – Robert Lindsay". BBC News. 30 October 2009. Retrieved 22 May 2010. ^ Aitkenhead, Decca (13 January 2007). "I feel that Blair is a man trapped". The Guardian. London. Retrieved 22 May 2010. Robert Lindsay on Who Do You Think You Are? 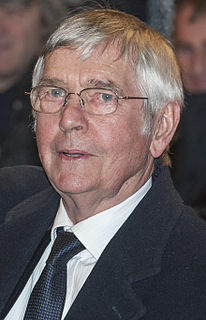 Sir Thomas Daniel Courtenay is an English actor who came to prominence in the early 1960s with a succession of films, including The Loneliness of the Long Distance Runner (1962), Billy Liar (1963), and Doctor Zhivago (1965). Since the mid-1960s, he has been known primarily for his work in the theatre, although he received Academy Award nominations for Doctor Zhivago and the film adaptation of The Dresser (1983), which he had performed in the West End and on Broadway. 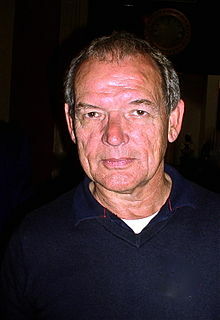 He was created a Knight Bachelor in February 2001 for his services to cinema and theatre. Tim McInnerny is an English actor. He is known for his many roles on television and stage. Early in his career he featured as Lord Percy Percy and Captain Darling in the Blackadder series. Julie Claire Hesmondhalgh is an English actress, known for her role as Hayley Cropper in the ITV soap opera Coronation Street between 1998 and 2014. For this role, she won Best Serial Drama Performance at the 2014 National Television Awards and Best Actress at the 2014 British Soap Awards. Lindsay Vere Duncan, is a Scottish actress. On stage she has won two Olivier Awards, a Tony Award for her performance in Private Lives and a Tony Award nomination for her role in Les Liaisons Dangereuses. Duncan has starred in several plays by Harold Pinter. Her best known roles on television include: Barbara Douglas in Alan Bleasdale's G.B.H. (1991), Servilia of the Junii in the HBO/BBC/RAI series Rome (2005–2007), Adelaide Brooke in the Doctor Who special "The Waters of Mars" (2009) and Lady Smallwood in the BBC series Sherlock. On film she portrayed Anthea Lahr in Prick Up Your Ears (1987), voiced the android TC-14 in Star Wars: Episode I – The Phantom Menace (1999) and Alice's mother in Tim Burton's Alice in Wonderland (2010), and played the acerbic theatre critic Tabitha Dickinson in Birdman or (2014). David Schofield is an English actor. He has appeared in numerous television programmes and feature films during his career. Clare Frances Elizabeth Higgins is an English actress. Her film appearances include Hellraiser (1987), Hellbound: Hellraiser II (1988), Small Faces (1996) and The Golden Compass (2007). Alex Gaumond is a Canadian actor, singer and songwriter known mainly for his involvement in West End theatre.